Contrary to what some CRAZY people might think (yeah, K.L., I mean you! 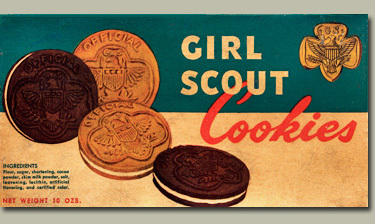 ), Somoas are not only the best Girl Scout Cookie; they're one of the best cookies PERIOD. I mean, the truth is–with all the caramel and coconut and such–they're basically candy bars masquerading as cookies. Anyway, I happened upon a cookie stand outside my local grocery this weekend and I've decided that it's my civic duty to tell the rest of you peeps that this is the last week to buy them before they once again disappear into the girl scout cookie-free abyss. Also, I would feel better about all my cookie-related weight gain, if the rest of you looked a little fatter too. So, do a good deed and eat a box, please. Seriously. There's room for you on the couch.